Today, a quick product spotlight for your enjoyment. I just love my Bind-it-All. Sadly, I don't have much time to play..... I haven't even made a REAL project yet (I've just "play" punched so far). I have all sorts of ideas running through my head, but no time to execute. So, I live vicariously through the wonderful project my loyal customers create. 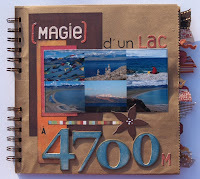 Below is a brown bag album made by one of my French customer. ----sidebar ---- I was born in France and speak French fluently. This has enabled me to serve a growing customer base in France. There are so many talented ladies who have discovered the joys of scrapbooking and cardmaking in the past few years. But I digress. Below is a brown bag album made by Cathy (yes, a very anglo name, but it's short for Catherine!). 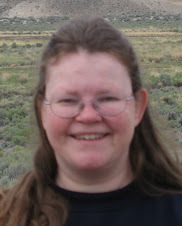 Cathy recently took a trip to Tibet. She made this wonderful album illustrating a salty lake high in the Tibetan mountains. Cathy used the Bind-it-All to finish off her album. I hope you enjoy this feast for the eyes. Decidely, some vendors are much faster than others at recovering after CHA. We've already received shipments from several companies. Yesterday, we received 21 boxes from Zutter (the makers of the Bind-it-all). Sadly, there were supposed to be 22 boxes in the shipment, and of course the missing box is the one with all the new stuff!!! LOL!!! But I'm sure it will be here today. Come take a look at www.franticstamper.com/binditall.htm for the NEW carrying tote for your Bind-it-All as well as an idea book and a book binding tool kit. We're also now re-stocked in machines and wires! Another huge shipment came in from Karen Foster. I haven't had a chance to upload all the new products on the site yet, but will we working on it within the next few days. There are some nice lines, including some very "male" themes like hunting, wildlife, skater, sports, and four-wheeling, as well as some traditional themes. One product that is very exciting to me (but hard to visualize) is the Scrapbook Film. It's a plastic-feeling material, translucent in color, pre-cut into alphabets. Now, the exciting thing is that you can use all sort of products to embellish them. You can use alcohol inks, stamp and emboss (yes, it will take heat embossing), paint and sand, etc. I can't wait to try the alcohol ink technique on them (when I get a free moment that is). Zsiage also has beautiful papers and lots of chipboard alphabets in many sizes. I can't wait to see what UPS brings us today! !